Fullscreen.me is a neat service I discovered last night which enables you to create iOS web apps that run in full-screen mode with just a few taps. 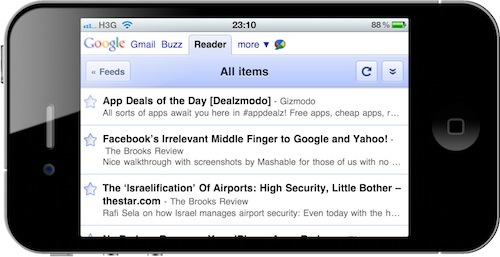 Many popular web services out there come with iPhone and iPad specific interfaces (Gmail, Google Reader, Flickr), but wouldn't it be great to easily run them in full-screen mode instead of being forced to open them in Mobile Safari every time you launch a webclip? Fullscreen.me does just that: it turns websites into full-screen web apps. You can choose from a set of built-in services (namely Google products) or manually enter a URL and make your own web app. What's cool is that Fullscreen.me lets you pick your own icon (stored somewhere on the internet) to override a website's default apple-icon.png -- meaning no more fuzzy Gmail icon on your Springboard. You can also set a custom status bar color or create a "splash URL" to display before the web app fully loads. You can try out Fullscreen.me by opening it on your iOS devices. Really good stuff.